This project by Shorcrete Services involved the stabilisation of the carriageway which was washing away with each tide. The carriageway contained High Voltage cables, live sewer and other services. Work was completed between tides with a fast setting high-strength shotcrete. The stabilisation works then allowed engineers to devise a suitable long‐term solution to the collapsed river wall and its eventual reconstruction. 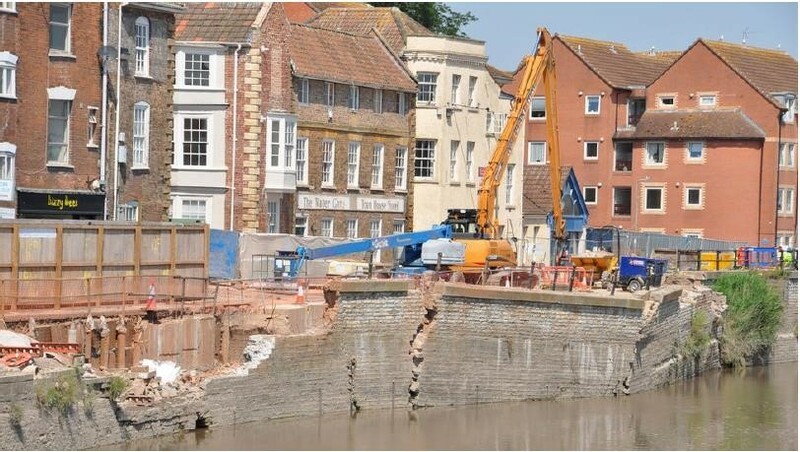 With this short‐term stabilisation, the carriageway would have continued to erode, resulting in the damage of the town’s services and potential collapse of the riverside buildings. This project was awarded the 2012 Fleming Award. equipment were on site within 12 hrs. 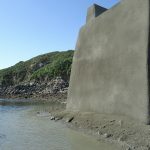 works to be completed between tides. removal of the masonry and its subsequent reuse.